Welcome little baby horse to the world. The horse is the seventh of the Chinese zodiac calendar, twelve year cycle. The Chinese New Year 4712 (2014), the year of the horse is also known as the Lunar New Year. It occurs every year on the new moon of the first lunar month. The next year of the horse begins on January 31, 2014 and continues thru February 18, 2015. People born in the year of the horse are extremely proud people with an incredible will and determination. Please note that the photo in this listing may appear lighter than the actual color. The actual t-shirt color is black with red logo artwork. Other sizes and colors available, please contact me thru Etsy conversations for current availability. 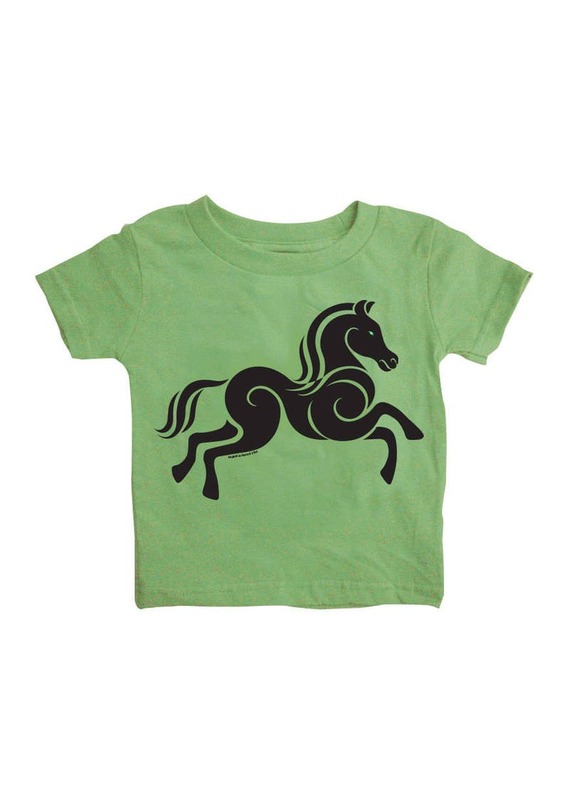 The horse logo shirt is also available with black ink on a red, pink, blue, or a rust t-shirt (please see 2nd, 3rd, 4th or 5th images for color options). Shipping costs are estimated at a flat rate for items shipped within the United States. shipping can be provided at an additional cost determined by the location and weight of the package. A beauty of a card! The purple color is so vibrant. I cannot wait to send this off for my niece’s birthday. The extra service afforded me was just fantastic!! I liked these Year of The Boar cards so much, I ordered twice so that I could share with more people!! The cards are really nicely produced, and the shop owner took great precautions in packaging. Both my orders were safely received, no cards were harmed in transit. I will happily order again from 88avenue!! These cards are beautiful, well-made & of high quality. There is an error in the years listed. It's minor: a repetition. available, and the complexity of the request. Please check the listing description for content, actual size and colors. Please contact me for other sizes, and style availability. Refunds are only issued for damaged or loss merchandise. Please return damaged merchandise or send (via email) photos of damaged merchandise for confirmation. After confirmation of the damage, a refund will be provided. If you do not receive the merchandise within a week of the shipment date (unless this is an international order), please contact me. International orders may require a longer shipment time). Merchandise that is determined to be damaged or lost will be replaced. Shipping cost include USPS first class mailing and material cost within the United States. Please contact me for international shipping cost, or if you need faster delivery using other options such as priority mail or express mail.